General TV Channel / TV5 broadcasts via satellite, D-Smart and internet. 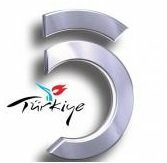 TV5 is known to be the leader of Necmettin Erbakan, the Milli Görüş political and social movement. When it was first established, the director of the general publication was made by the communicative academician and writer Yusuf Kaplan. In this first period, the channel has produced many quality and quality programs. Yusuf Kaplan was taken from the editorial board on the grounds that the channel proponents did not include political propaganda as expected. The channel changed the logos used in the first period and passed the currently used logos. TV5's building and studios are located at Sefaköy Milsan Complex.